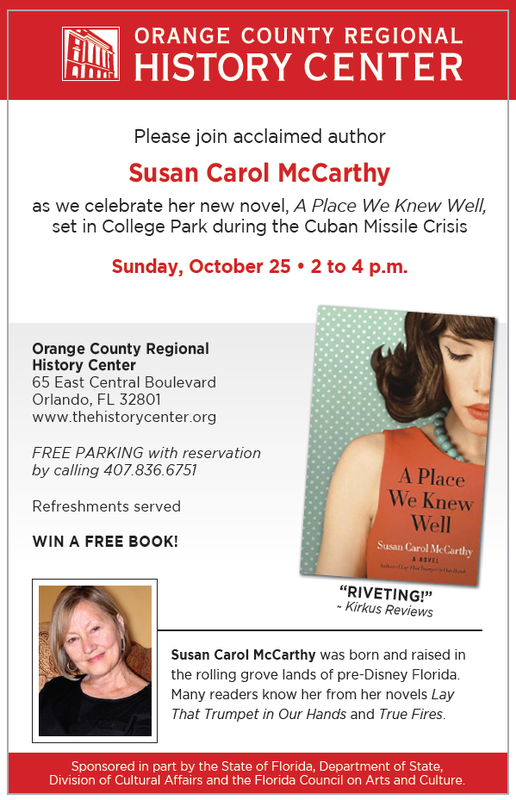 ORLANDO, Fla. – October 10, 2015– The History Center welcomes Susan Carol McCarthy onOctober 25 at 2 p.m., as she launches her latest novel, A Place We Knew Well, set in Orlando’s College Park neighborhood during the Cuban Missile Crisis in October 1962. Praised for her ability to blend “fact, memory, imagination, and truth with admirable grace” (The Washington Post), McCarthy was born and raised in the rolling grove lands of pre-Disney Florida. Many Central Florida readers know her well from her earlier acclaimed novels, Lay ThatTrumpet in Our Hands and True Fires. Now, McCarthy deftly recreates the world of Orlando in October 1962, a time of looming fear and crazy contradictions, from dog tags for school kids to weddings in fallout shelters. As College Park buzzes with speculation about the traffic at McCoy Air Force Base, Edgewater High senior Charlotte Avery fends off barbs from her troubled mother about her Homecoming date — Emilio, a Cuban exile — while Charlotte’s dad looks to the skies and senses big trouble, even before President Kennedy’s TV speech about Russian missiles just 90 miles from Florida. The History Center’s October 25 book launch begins at 2 p.m. with light refreshments, followed by a talk by McCarthy, questions and answers, and a book signing. Copies of McCarthy’s earlier novels will also be available for purchase. The free program includes parking near the History Center and a chance to win a copy of A Place We Knew Well. For reservations and parking details, call 407-836-6751. “McCarthy memorably captures the impact of the intense military mobilization on residents. Next Post Residents received locally designed Magic T-shirts as part of Pure Magic Tip-Off Presented by Chase.